An F-35C Lightning II arrives April 15, at Hill Force Base, Utah. The aircraft is the first Navy variant to arrive at the base where it will undergo depot modifications through this summer. The aircraft is assigned to the Navy’s Strike Fighter Squadron 101 at Eglin AFB, Florida. HILL AIR FORCE BASE, Utah — The Ogden Air Logistics Complex here became the first depot facility to perform modifications on all three F-35 Lightning II variants after it inducted a Navy F-35C carrier version April 15. 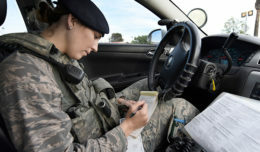 “Hill has the capacity to accomplish the needed modifications and it is important to optimize the workflow within the Air Logistics Complex,” Weisgerber said. 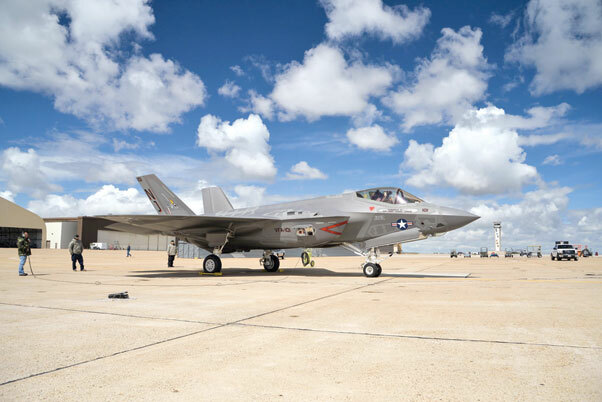 The first F-35 arrived at Hill AFB for modifications in September 2013. 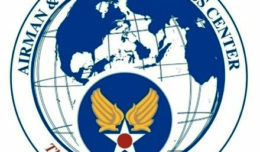 Since then, the depot has performed modifications on the Air Force’s fleet of conventional takeoff and landing F-35As. It also has completed work on four Marine Corps F-35B short takeoff/vertical landing aircraft, helping the Marine Corps reach initial operational capability. For the Navy’s carrier variant, the complex’s 570th Aircraft Maintenance Squadron, along with Lockheed Martin, will perform structural upgrades, low-observable restoration and system modifications that will enhance performance across the aircraft’s service life. “The men and women of the 570th (AMXS)have risen to the challenges of supporting the dynamic changes in this program and take great pride in being the first depot to work on all three variants of the F-35,” said Greg Hoffman, the 570th AMXS director. With the program’s ever-evolving requirements, exact numbers of how many aircraft will be worked on this year is not yet available. The squadron’s main focus centers on completing work on the Air Force fleet of F-35A models and Navy’s F-35C models, and returning the aircraft to the warfighter better than they arrived.